This wiki page is intended as a starter and briefer for first-time or inexperienced pilots to get into or out of Innsbruck/LOWI. The reason to write such a page is, that many people fly there. It is the default airport for X-Plane 9, is extremely beautiful to fly (great mountains, deep valley) and LOWI is quite challenging to fly. The result: VATSIM traffic regularly exceeds real-life traffic. Nevertheless, many pilots make fatal errors. They make controllers either laugh or swear, trigger go-arounds and smash virtual holes into the virtual mountains. If all VATSIM aircraft accidents around LOWI were real, the valley would be an enormous cemetery. AIRAC status is 1704 as of April 2017. It includes updates on the new SAXFRA area over Austria East of Innsbruck and the de-activation of AB NDB. Navigraph data do not include approaches and departures with non-RNAV parts in it. This is normal - you should not fly them with AP on auto anyway. What can you do? Do it like any pilot: Take the chart, tune in the navaids and fly them "the old way". evade: request one of the RNAV departures or arrivals you are able to perform. Please note that they are all special performance procedures and will (as-real-as-it-gets) only be cleared on request. 27 April 2017: Absam NDB is going home to eternity. As replacement, RUM NDB will be activated in the vicinity. November 2016: added some information on SAXFRA, which changes a little in Innsbruck, but a great deal in the rest of Austria. If you fly East, you should know. Read this section for details: #A note on SAXFRA. 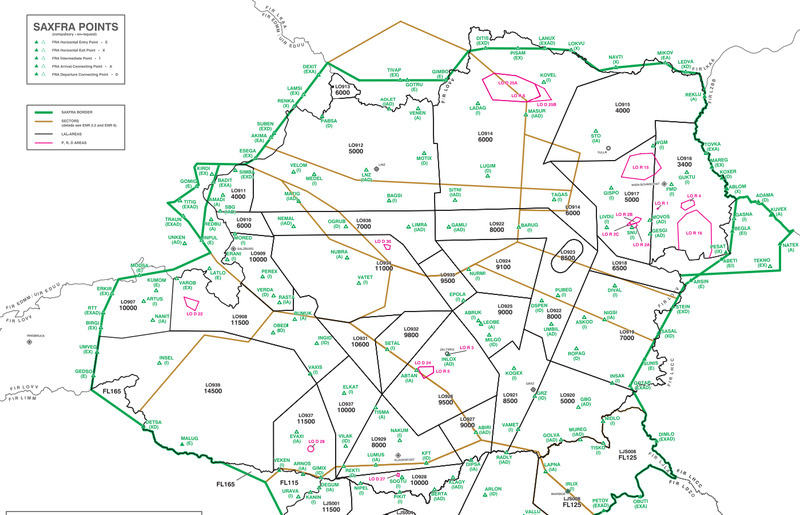 The airspace has changed considerably in 2015 SRA were replaced by TMA - sections updated. The old LOC DME West has changed and starts now in ELMEM (like all other RNAV approaches from the West) instead of KTI NDB. Aviate: You must be able to fly your plane by hand: Keep it straight and level, make controlled (tight) turns while holding level, being able to descend and climb in a controlled way. This means that you are able to control speed, altitude, vertical speed and still be able to deploy/retract flaps, speedbrakes and gear. Navigate: You must be able to keep a course you have in mind (and in the chart next to you). You must be able to watch your radar and VOR instruments. Never point the nose of your aircraft where your mind hasn't been a minute before and read here why. Communicate: If you fly online@vatsim, you also have to be able to talk and listen to ATC too, report positions, give readbacks, and remember clearances. A note from us controllers: When traffic is heavy, we strongly ask for voice or - at least - voice receive. Communication is intense and in doubt, text users have to wait. Fly procedures! Innsbruck is unique in one way at least: There are no vectors to the runway, under no circumstances. See the topology section below if you want to know why. In any case: You have to fly published procedures, and that's what you learn with this wiki document! An example: On downwind for runway 08, you have to keep straight and maintain 3700-4000ft altitude and maintain terrain separation visually and put flaps and gear down and reduce to landing speed and watch one DME indicator to decrease first and increase to 3,6 when you have to turn for final, where you have to descend and bank 30° right and keep visual separation to terrain and read back your landing clearance. No wonder that large birds have two pilots. One more thing: be reasonable with your aircraft selection. Consider airport elevation (1900ft), runway length (2000m), obstacles (mountains) and aircraft weight and you will find out that Concorde, A380, B747 and the like do not really fit with LOWI. Largest aircraft in real so far was an A330 weight restricted with fuel to Vienna only. If you fly Innsbruck, you have to know the charts - it it's busy, expect diversion if you don't have them. The overview for all charts is here at the VATSIM Austria homepage. You need to study the charts in advance to understand them. Browse them together with this tutorial. Some folks fly in just with their FMC loaded - In general, that's not enough, as every approach contains a visual part - you need to see the charts to find your way. Remember: No vectors, if you are lost. LOWI is in a deep valley which runs east-west roughly. At a more detailed look, you see that exactly at Innsbruck the valley bends to a "smile". This narrows the options to reach the airport without hitting a mountain: For large birds, only east and west are possible. For VFR, two more add to it: from the North via Seefeld (NOVEMBER route) and from the south (BRENNER-SIERRA). To VFR, see later. As space is tight around LOWI, airspace is packed with regulations, namely: There are TMA (Terminal Mandatory Areas) and a CTR (Controlled Traffic Region or simply "control zone"). Innsbruck CTR covers the valley up to 7000ft altitude (blue in the graphic below). Remember that you have to request and receive permission from LOWI_TWR (of LOWI_APP if TWR is offline, or LOVV_CTR if LOWI_APP is offline) to fly into it. TMA LOWI 1 sits right on top of the CTR (green-and-blue), but reaches out into the upper Inn valley towards the VFR reporting point WHISKEY 1, and up towards the Brenner to VFR reporting point SIERRA (the green "ears"). TMA LOWI 4 and 5 do the same Eastwards. For IFR aircraft, these TMA and CTR are pretty negligible, as you are guided by ATC through, but for VFR, your and others' life depends on it - see the VFR section for details. If you come from the East, then fly straight to an Approach Point for Innsbruck. Luckily, they stayed the same: RTT, NANIT. No RASTA anymore - that's an entry Point for Salzburg. If you fly out towards the East, then you will be cleared to an entry point for SAXFRA (RTT or OBEDI), and your next waypoint will be the exit point out of SAXFRA. Very simple, unless your FMC wants you to do something different (smile). If your briefing includes a RASTA departure: forget it: RASTA is only an approach point - expect a RTT clearance instead. The STAR chart (here) shows: You have two standard and two RNAV approaches into the valley. There are two more which are visual and not charted. Be aware that all non-RNAV approaches lead to all runways - always with visual approach, some with steep turns. The RNAV approaches lead to a defined runway only. You can arrive without a STAR: Either by using an airway which passes RTT NDB (Y107 or Y103), or by crossing the SAXFRA airspace with RTT as exit point. Don't bother, just don't expect an arrival clearance as you are already there. Approach will then tell you if that's ok or offer alternatives. ... is the most common approach into Innsbruck. See the LOC DME East chart (here). This approach is fairly easy, but it's like getting a thread into a needle's hole: Don't miss it. Be aware, that the phrase LOC DME East means something: The localizer OEV leads to the runway, but with a 5° offset to the north - it's NOT an ILS and you can't land with it! Also, the primary means for descent is the profile as shown in the charts. Additional descent guidance is given by a glideslope. It is intended to bring you close to the airport, but then you have to disconnect AP and land visually. See the Visual Approach Chart (here) for details. when cleared LOC DME East approach, you leave RTT NDB at 10.000ft (local QNH! Charts say 9.500ft, but ATC clear 10.000ft) with 210° and grab the OEV (111.10) localizer and glideslope. Strictly, the glideslope is only an indicator and you have to follow the altitude limits on the chart, but you might as well do the other way around: grab the glideslope and monitor altitude and OEV DME. Why that? Because in real life, the beacon could be mislead by reflections from the mountains. When established on the LOC, you are transferred to Innsbruck Tower (120.10) who will tell you wind, which runway to expect, and to report runway in sight. Continue descent on the glideslope, slow down to reach 6,3dme OEV at 160kts or less. Yes, Tower tells you the runway, and that means: Be prepared to fly either straight into 26 or circle for runway 08 - see later in this document how. If you are unable for circling (maybe you are a Heavy bird), then tell Approach at contact. Go-around is difficult, as there are mountains everywhere but behind you. You have to climb with max rate at approach course. At 1nm DME OEV (that's one mile before the airport) turn tight left (1600m radius, that is roughly 25-30° bank). In real life, pilots must fly this by hand and so should you (autopilots usually don't turn that steep and sometimes even turn the wrong way). This is the easy way, and still many pilots screw it up: Tower will clear to land. Your MAPt (Missed Approach Point) is at 6,3dme OEV. You have to go around if you are not cleared to land or informed about late clearance. Anyway, you disconnect your AP now and continue visually. As the runway is some degrees banked to the right, you fly a dog's leg over Innsbruck (left, then right) to align with the centerline. If you don't see the runway: go around! Fly the go-around manually or end up in the Sistrans Airmen's Cemetery. The one most common mistake here is to think that OEV is an ILS aligned with the RWY. Those folks smash some GAC aircraft on the apron and hit the terminal building. LOWI_TWR: Leipzig Air 123, Innsbruck Tower, servus. Wind calm, expect circling runway 08, report breaking off for circling. This clearance is valid all the way to runway 08 final. You have to report your turning off, but you continue as charted. TWR may tell you to report other points: downwind (south of the airport), base or final. Before turning left: set your radar altitude warning to 400ft - gives you a chime when you get too low. prepare to level off at 4000ft altitude for the downwind circle (that will be the case about 6dme OEV). At dme 6,3 OEV: Check, if you have ground view, or go around, because the rest is purely visual. Now disconnect the AP and level off between 3700ft and 4000ft MSL - the chart is only a guideline, fly visually! Between now and 4,2dme OEV turn left (230° is a guideline - fly visually!) towards INN NDB. The route leads you over the green fields on the left side below the Patscherkofel. Scary? Watch your altimeter and stay between 3700 and 4000ft. Caution: From here on, go-around is right around! The 400ft "minimums" warning will prevent you from getting too low. Before reaching INN NDB (where you would hit trees) turn right for the right downwind past the airport, passing INN NDB on your left hand side. On downwind, Prepare your plane for landing (speed, flaps all down, gear) and coninuously check your altitude: 3700-4000ft or you hit the church tower of Aldrans. Boy, this is a catholic country, they crucify you if you damage it! Watch OEV DME (OEV is directly at the airport) decrease below 3nm and increase again as you fly past the airport. When OEV DME has risen again to 3.5nm (that just about when you say "ooh sh.." as the mountain ahead approaches), do a sharp right turn and smoothly descend into the valley - don't be too shy, but don't dive. Perfect would be: Start the turn firmly, and when you have settled in the 25-30° bank, descend smoothly (you still have a hill below you). When you have completed a 90° turn, look to the right for the runway (the hill will most likely be behind you now), turn and descend firmly for the centerline. With a bit of training you find yourself head on runway 08 for landing. First too low: Pilots leave the AP with ILS on and get too low at dme 6,3 OEV. Disconnect early to level off at 3.700 (better 4.000) ft.
AP on: Pilots fly the circle with heading and v/s mode of the Autopilot and hit the Patscherkofel Airmens' cemetery. Fly by hand, this is what pilots are here for. Then too high: Pilots don't descend at the final turn and end up too high, desperately dive and land way too fast. You have to turn and descend (again, by hand). It is a nice, gradual descent - no need for a vomit-dive. If you are too high, request go-around or (very smart!) another visual circle. or too fast: If you forget to prepare your aircraft for landing on downwind (when the airport is to your right), you won't have another chance, as you have to descend firmly on final. If that happens to you, go around or request another visual circle. Luckily, the hospital is at the end of runway 08, so you might crash close to help. ... is a special performance for bad visibility: It starts the same as the normal LOC DME East approach, but you continue to fly the LOC and glideslope to the outer marker, where you have about 3.500ft and then do the circle (the dotted line on the visual approach chart here). You need to have a special performance (small) plane for this. In real life, this is rarely used, because with such bad visibility, aircraft are normally cleared for runway 26, unless there is strong easterly wind. When easterly wind is strong, bad visibility is unlikely. For decades, this was the west entry into the valley. With new RNAV approaches via ELMEM, the LOC DME West is a remnant of past fly-by-hand glory - and it's fun to fly! Request it and experience the thrill. If you fail, then you go around to RTT for the East approach. Caution for "old" MSFS users: For this approach, you need the OEJ LLZ. In FS09/FS2004, this localizer is missing! You can buy [Gianni's "Approaching Innsbruck"] at Aerosoft or get this free patch [from the AVSIM library]. Mountains to the West are higher, so you level off at ELMEM at 13.000ft (local QNH!). If you come from the South, you cross mountains even higher, so you fly a teardrop entry (see here) as if you were to enter the holding, and maybe you must enter the holding too. LOWI_APP: LHA123, cleared LOC DME West approach. Leave ELMEM at 101° at 13.000ft. Descend to 11.500ft towards the waypoint KUDAV (the former KTI NDB, which is now shut off). Turn your OBS to 67° radial. Make sure you have the localizer OEJ 109.70 tuned and receive a signal before KUDAV (If not, report to ATC and expect vectors to RTT NDB for a LOC DME East approach). Enough before KUDAV, Check your speed and configuration! You should have 160kts and flaps at least half down. If you are unsure, prepare for landing (speed, flaps, gear). A trap awaits you: If you don't slow down at the beginning, you will be too fast for flaps and gear to slow down later - go-around is the only escape. Join OEJ CRS 067° and descend according to the profile shown on the charts (IT IS A LOCALIZER ONLY, no glideslope guidance). at descent, you have time to set your radar altitude warning to 400ft - comes handy with circling 08. A thrilling experience to descend from the snow-capped mountains into the valley! If you have a light plane, you may opt for a visual approach via WHISKEY. To do this, you request it from APP already at ELMEM. You turn off course after ELMEM into the valley - you could head for 08, if Tower permits. This is visual, so you can only do this when you have clear ground view. Too fast: The western descent is twice as steep as any ordinary descent into an airport. Once you are too fast to lower flaps, there is no way out except go-around. 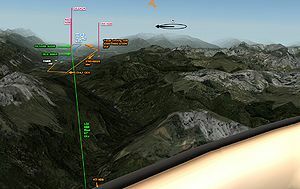 No localizer: OEJ (109.70) is NOT part of the standard FS2002 and 2004/FS09 sceneries (but included in X-Plane 9 and FSX). Check in advance, if you have it. Check before KUDAV, if you have the right localizer, and if not, request vectors to RTT (as you can't download and install the patch on the fly). Wrong localizer: Some pilots use the back course of LOC DME east (OEV), which gives smashing results in the Stubai mountains. No, there is no glideslope - descend with v/s or manually watching the table on the chart. Go-around is easy: 67° radial to OEJ and 65° radial out of OEJ to RTT. Don't miss it - mountains on all sides, and there may be arriving traffic on LOC DME East head-on (max rate of climb!). Bear in mind, where the approach ends: NOT at runway 08, but at 5000ft altitude over RUM NDB. This means: You fly over the airport at about 7000ft. Level off at 5000ft or where you are cleared to. That should be round the chime of the outer marker. Arrive at RUM NDB with 160kt or less. The final approach begins, and it is visual. too fast: Pilots who descend the glideslope with 250kts or more will unlikely to slow to 160 or below at the end and need to go around. Those who still turn right for final end up in the Sistrans cemetery. Dive for 08: Some pilots seem to think that the LOC DME West approach leads to runway 08 (deadly wrong!). When you see runway 08, you are still more than 5000ft above the airport. Pilots who try end up with a smashing 300kt landing on the LOWI cemetery. Luckily, the hospital is on the extended centerline 1nm down the runway, so maybe you crash close to help. LOWI_TWR: LHA123, continue,  wind 300° 8kts, expect circling runway 26, report RUM NDB. This clearance is valid all the way to final. Report RUM, but continue to final 26! When you reached RUM NDB, the airport is behind you, you have to turn. RUM NDB is on the north side of the valley. Behind the NDB do a steep right turn into final behind you (bank hard and be slow! ), simultaneously descend visually to between 4000 and 3700ft. The valley has a step on the southern side and below 3700ft you end up in the Sistrans cemetery. When the runway is ahead, continue descent and land. LOWI_TWR: LHA123, continue,  wind calm, expect circling runway 08, report RUM NDB. This is really fun! You have to circle twice, and you need to fly this by hand. At RUM NDB, the first right turn leads you to the southern side of the valley (bank hard and be slow!) while holding level. Don't wait for the turn without reason - you mess up spacing of arriving aircraft. Request an extension from TWR if you need to slow down. Poceed towards INN NDB, descend to an altitude between 3700 and 4000ft. Before INN NDB (where you will hit trees) turn right for downwind. Watch your altitude to stay between 4000 and 3700ft. The radar altitude warning set at 400ft will help you with a chime if you are too low. turn-and-descend onto final runway 08.
too fast at RUM NDB (160kt or above) and turning anyway: You hit the Patscherkofel cemetery. continue descent after RUM NDB: when you turn too low, you hit the step in the valley at 3500ft and end up at the Sistrans cemetery. Maintain 3700ft or above while turning west. turning into final too early (before D14.1 OEJ) and forgetting to descend: You end up above the airport and need to go around. turning into final too slowly: You end up in the Martinswand cemetery. Descent starts at WI001 which is (surprise!) RTT NDB, where all other aircraft queue in the holding. You sink into the vally a bit to the left of LOC DME East, past WI003 (which is the outer marker) and end up dead ahead runway 08. MAPt is extremely late - so well suited for very bad weather: Decision altitude is 2660ft, that is about half way from the outer marker to the runway - some 2 miles before touchdown. You really need to see the runway at that distance. If you don't have further clearance or too little visibility, you go around, and that means: You continue flying your programmed route with FMC on: It goes up the valley where it opens again, where you do a steep left turn and go back the very same waypoints you came from to enter the RTT holding. Why that? It might happen that you are heavy or one engine is dead and you can't climb a lot. This route gives you more than plenty of time. In reality, you climb max rate, and once you are clear of peaks, APP will issue a direct to your next try. If you want to fly your aircraft, then this is the most boring approach, as the aircraft flies itself. Still, you can use this approach if visibility is nearing 3km. (Scotty:) Captain, the Enterprise is fully automated. A chimpanzee and two trainees could run her. (Kirk:) Thank you Scotty, I will try not to take that personally. 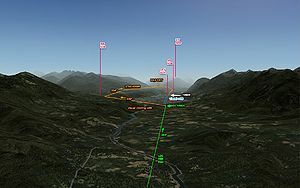 There were times, where many planes from the North and West wanted an "easy-in" approach to runway 08: So they requested LOC DME West approach, but before reaching KTI NDB (now KUDAV), they looked down to the left side, found the upper Inn valley free of clouds, and changed to visual approach. Maybe because of this practice, since AIRAC 1302 there is a new instrument approach, covering exactly that. It is not a complicated approach if you did your programming right, and it is a scenic combination of an instrument descent and a long visual part at the end. The aircraft must be GNSS equipped (which is not simulated at VATSIM, so just do it). ELMEM is IAF (initial fix): This is, where you should have your descent path identified. WI801 is IF (intermediate fix): Have it identified. WI802 is FAF (final approach fix): If you are not aligned on the descent path at that point, you have to notify approach and do another round. WI804 is MAPt (Missed approach point): At this point, you need to have clearance to land or to continue and have the necessary visibility (GPS descent ist for cloudbraking only), or go around. Minimum visibility is cloud above you when you reach 6000ft at MAPt, and visibility 5km or above. If you continue, you continue visually along the programmed go-around path and land runway 08. If you go around, climb and continue along the MATF (Missed Approach Transition Fixes) to WI001, which is RTT NDB for (most likely) another try via LOC DME East. TWR: AirChild 123, active runway is 26. Level off at 5000ft, continue visual via RUM NDB for circling 26. ACH123: Continue visual RUM NDB, 5000ft, AirChild 123. TWR: AirChild123, go around as published, contact Radar at 119.275. No visibility at MATF and still pilots continue. Very risky, and there are plenty of cemeteries around. Going around from MATF straight ahead and up: You will hit the Martinswand cemetery. No altitude monitoring and ending up way too high. This approach is basically the same as the GNSS Z 08 - only the MAPt is much later. This approach is for bad weather too, as the RNAV route ends at WI754 just short of the runway. In fact, this is the only bad-weather-approach to 08. The approach is only permitted for specially equipped aircraft (which is not simulated at VATSIM): They have to be fitted with GNSS and IRS and below -7°C they must have a compensated Baro-VNAV. This approach is not charted anywhere and only at Pilots' request. When reaching BRENO, you can request a visual descent into the Wipptal, the valley leading from Brenner to Innsbruck. You are transferred to Innsbruck Tower, and then you fly on your own - usually with the request to report the airport in sight. If you fly this approach with anything larger than a Dash-8, good luck. Depending on which runway Tower has given you, prepare for steep turns either left or right when you reach the main valley and join the visual approach patterns for runway 08 or 26. You might try this a few times offline before going online. Don't attempt to do this at Föhn conditions, where violent and turbulent southern winds wash you down into Innsbruck city center. Föhn is a particular weather phenomenon common to Innsbruck. A southern depression pushes northwards, is limited by an inversion at peaks' altitude, and gets caught in the mountains, sending high, gusty and warm winds through the passes down to the north. Typical conditions are winds above 20kt and gust up to 40kt (there have been train wagons blown over at Föhn!). Typically, wind descends the Wipptal (from Brenner pass northwards), blowing like through a nozzle right over Innsbruck, dividing itself into a low Eastern and Western blow down and up the valley - makes up a nice windshear and turbulence. The least turbulence is on the northern slope (strong uplifts), whereas the southern slope is full of rotors. As the airport is West of the city, local winds there are typically easterly (maybe even calm due to cold air remaining) with heavy turbulence above. People will need vomit bags and pilots need good nerves. "Föhn" procedures are at pilot's request. Föhn operations lead to rwy08only and are visual only (with Föhn, view is excellent). Arrivals come from RTT and descend high along the northern ridge between 8000 and 5000ft, were turbulence is least. Above the airport (sometimes as far as Seefeld) aircraft turn left and dive for base and final rwy08. There is no LOC DME West Approach at Föhn. Departures leave 08 with max rate of climb and drift left to the northern slope to climb out visually. ADILO departures also climb on the northern slope and turn westwards above the turbulent area. KPT departures are not recommended, as this SID turns very early = low in the middle of turbulence. Rather do the Föhn departure to the East, and when clear of peaks, request direct KPT. Innsbruck is CTR and TMA, which means: Don't fly around uncontrolled. You have to say your intentions and cleared by Tower (in CTR) or Approach (in TMA) and receive clearance to do that. "Flying in the vicinity" is too vague to be cleared. DO NOT ENTER CTR OR TMA WITHOUT CLEARANCE! There are plenty of large birds flying around IFR - they are not obliged to look out for you (and they never do). Helicopters from the heli station south or the airport (ICAO: LOJO, pronounced "Lojo" by Locals) are not part of the airport: You need clearance to fly in CTR, but TWR will tell you "takeoff at own discretion". Helis from the airport need a takeoff clearance. Gliders operating from the grass runway north of the tarmac is the same. Local procedures require winch operators or pilots to ask for CTR entry, but not for takeoff clearance. Same is for landing: If you operate within the glider area (see VFR chart), then act at your discretion. You might want to avoid a B777's wingtip turbulence though. Around and above, there are TMA, which are controlled by Innsbruck Approach. Their purpose is to protect IFR aircraft from VFR thin air heroes. Usually, you won't want to mess with TMA unless you fly a scenic high route over the alps. If you do, you need to make sure, where you are and how high you are. If you leave CTR to the above, you hit a LOWI 1 TMA for sure. If you leave up the Brenner valley and stay less than 1000ft over ground, you are free after leaving CTR. If you fly down the Valley (to Germany) and you stay below A8500ft, you're free after leaving CTR. If you fly up the Valley (towards Arlberg), stay within 1000ft above ground and you're free. Same for leaving via Seefeld to Germany. For CTR, request entry from Innsbruck Tower. For TMA, request entry from Innsbruck Radar (Approach). For CTA in Class D (that's outside TMA and between FL125 and FL195), request entry from Innsbruck Radar (Approach). Hell knows why you want to fly VFR above FL195, and only Hell will clear you - it's IFR only. If you have clear view, then avoid all TMA - Approach is busy with IFR and won't be happy. That means, you have to stay below the TMA lower limits. You will only have to request entry into CTR from Innsbruck Tower. From the North: Mostly coming from Munich, aircraft use the wide valley at Mittenwald and Seefeld. What is called the NOVEMBER route (NOVEMBER1-NOVEMBER2-WHISKEY2-INDIA) lets you approach the airport from the West. You should contact LOWI_TWR at NOVEMBER 1 at the latest and be at 7000ft or below to avoid TMA. From the East: ... comes up the Inn valley and is called the MIKE-route (MIKE1-MIKE2-MIKE3). This route somehow criss-crosses the valley for a good reason: It nicely squeezes VFR traffic under and besides the LOC DME East approach. If you come out the Zillertal (south of MIKE1: FOXTROT), then you could request clearance direct FOXTROT-MIKE2: You will climb high and descend fast, and the route crosses the LOC DME East approach, so maybe you are cleared FOXTROT-MIKE1-MIKE2. Stay below 9500ft (LOWI 5 TMA) and 8500ft (LOWI4 TMA) before entering CTR. From the South is the route down the Brenner valley (BRENNER-SIERRA). Report to LOWI_TWR at BRENNER and then descend 1000ft over ground until you reach 7000ft to avoid LOWI 1 TMA. From the West is the Whiskey-Route (WHISKEY1-WHISKEY2-INDIA) down the Inn valley. Stay below below 10500, 9000 and 7000ft (LOWI 3,2,1) to avoid TMA, or even simpler: Descend with 1000ft over ground until you reach 7000ft, and you are good. Tower will clear you how to approach the airport and land, and he might do that quite eclectic - TWR will tell you which route, which reporting points, where to hold and how to turn into final. DO NOT FLY NORTH OF THE AIRPORT without being told - Virtual rock climbers complain about the virtual holes and debris in the virtual mountains, made by virtual aircraft, and gliders operate there too. OEDAP, cleared to enter Control Zone via MIKE route, report MIKE3 and hold south or the airport, 3500ft or below. OESWX, cleared via November route, report WHISKEY 2 and runway in sight, expect runway 08, 3500ft or below beyond WHISKEY 2. DACHS, cleared entry via MIKE1 direct to the airport, report 3 miles final runway 26, 4000ft or below. ... is just the other way around, and you will usually receive exit clearance together with taxi or takeoff clearance. Want a nice VFR round? Fly out November route and turn right at NOVEMBER1, crossing the Karwendel until Achensee, where you can descend and enter CTR at MIKE1. Keep below 7000ft until NOVEMBER1 and then up to 1000ft above peaks, until you reach MIKE1 with 7000ft or below. You can continue after MIKE1 across to FOXTROT up the Zillertal (below 7000ft or 1000ft over ground), fly up to the glacier-covered peaks and descend the valley to BRENNER, reporting back to land. The far eastern part is for General Aviation (GAC East). The middle part of the apron is for larger birds. Local General Aviation is at the very Western part in front of Hangars I, II and III. In the western part is a "cutout" in the grass. On earlier charts, this was marked as helipad. Some choppers still use it. Rescure and police helicopters operate from the "Flugrettungszentrum" (ICAO: LOJO), which is south of hangar III and the engine run stand. Local pilots pronounce it "Lojo" and don't spell it. LOJO is not part of any standard package. Giannis MSFS add on scenery has it, and X-Plane has it too. LOJO is not part of the airport, but within the airport's CTR, so you need entry clearance by TWR and route to LOJO, but no landing clearance - land at your discretion. Taking off is the other way around: CTR entry clearance by TWR and takeoff at your discretion. Caution (1): Innsbruck normally has no fixed runway configuration (unless required by wind). As heavy metal aircraft can only land runway 26 and only takeoff rwy08, expect to depart either way, or even be recleared from one direction to the other. Caution (2): For most departures, you need OEJ VOR, which is not part of MSFS standard installations. Try X-Plane or look for an add-on, like [Gianni's "Approaching Innsbruck"] payware or fly an approximation. Caution (3): With Navigraph AIRAC cycles >1213, you will not find all SIDs in your FMC - in fact: only very few. Look at the charts and fly them "the old fashioned way". The following SIDs all have the same pattern: RTT3J, OBEDI3J, UNKEN2J, KOGOL3J. You take off on runway heading from runway 08 (max rate of climb), until you grab the 067° inbound LOC OEJ. You continue the 064° outbound radial until at 9.500 ft. There, you will most likely receive a direct instruction to your waypoint from Innsbruck Approach. If you are too low, you must fly past RTT NDB, do a left turn back to RTT and then continue. Important: If Tower tells you "max rate of climb", then do so. It is likely that an LOC DME East inbound aircraft is on its way, which should be way below you. If you don't have 5.000 feet at RUM NDB, you are not climbing enough. Standard climb rate is 4,8% minimum until passing 6700ft. Clearance Altitude is FL160 at low traffic. At high traffic, you are cleared to a lower altitude (where a "hole" in the RTT holding is free to fly through). Stick to it or hit another fellow aircraft. Since November 2016, there is no more RASTA3J departure. Expect the RTT3J departure to enter the SAXFRA area, from which you fly directly to your SAXFRA exit point. ADILO is to the west. How to get there from runway 08? Look at the chart: it's straight out to OEJ VOR (109,70 KHz) where you should have minimum 6000ft, then a steep right turn to INN NDB (420) and to ADILO. Important: This SID is definitely "max rate of climb" - you won't manage the turn above OEJ at high-speed-and-low-altitude. The chart says that you need to climb at least 8,8% (535ft/nm) until OEJ and then 6,5% until completion of turn. Minimum bank is 25°. To be on the safe side: Stay below 170kt for the turn and set the bank to 30°. ... is a departure route directly to the South. You fly out runway heading, turn left and grab the 67° inbound radial of OEJ. You have to climb hard (8.8%!) for this. Past OEJ you turn steeply right to INN NDB, where you turn right to BRENO. If you miss the last turn, you can try an emergency landing at the Stubai Glacier. It is similar to ADILO1H, but you climb really hard (10% or 608ft/nm until INN NDB) to reach RUM NDB at 5600ft or above, then make a steep right turn to meet INN at 9400ft (which is already almost clear of peaks). They you fly directly KPT VOR. Stay below 250kt (and well below for the turn) until 11000ft and have a bank angle of at least 25°. Not that steep as ADILO1H, but still twice than its RTT2J sister. Fly with minimum 7% climb WI520 - WI521 (then with min. 3,3%) - WI522 - RTT. ...are completely identical to RTT3J and KPT3J. They just have lower visibility requirements. Tower has to know the difference, not you. Runway 26 is westbound. Still, most SIDs go to the East! All eastbound SIDs out of runway 26 start with a visual manoevre: The valley up the Inn is steep, but shortly after the airport it widens a bit. When you take off, configure your plane for slow-speed-and-max-rate-of-climb (165kt or below). You climb max rate, do a slight right turn to follow the big wall (Martinswand), and once above 3.200ft (terrain below! ), you do a steeep (minimum 25° bank) left turn and grab the 67° inbound radial of OEJ (109,70). Make sure you receive the Localizer (Standard MSFS don't have it) and that you don't fly past the localizer to avoid the mountain. ... are RTT4H, KOGOL4H, UNKEN3H and OBEDI4H: Fly out by hand, leaning slightly right after takeoff, then sharply turning left for more than a 180° turn to grab the OEJ 66° inbound radial. Past OEJ, fly 64° outbound radial past RTT and turn back left. Nobody flies this: As soon as you are clear of peaks (10.000 for KOGOL and UNKEN, 13.000 for OBEDI), APP clears you to cut the corner. Since November 2016, there is no more RASTA3H departure. Expect the RTT2H departure to enter the SAXFRA area, from which you fly directly to your SAXFRA exit point. Adilo is to the West, but don't fly straight out west - there is some rock in the way. Instead, turn twice: Fly visually a steep left turn to grab the 66° OEJ inbound locator. At OEJ, turn sharply right towards INN NDB and then ADILO. If you climbed max rate, you should be clear of peaks at OEJ and don't need to worry about the turn radius. If you are below 10.000ft, bank 25°-30° and stay below 165kts. See the SID description in the chart: Climb minimum 6,5% (395ft/nm) until OEJ and 6,0% until completion of turn. ... is like ADILO3H but turn left at INN NDB and leave with 288°. Climb 6,5% or more to avoid mountains. This departure is great fun. It's a visual departure straight out runway 26 (you are guided by fixes, but fly by hand). At WI507 you kick in the FMC and fly instrument via WI802 and MOGTI. ... is a RNAV departure for heavy birds. You fly along waypoints up the valley, turn around, fly back over the airport and to RTT NDB. In Practice, you fly it until clear of peaks and then turn direct RTT NDB when instructed to do so by Approach. In real life, Air Berlin to Germany like to request this SID: They fly out to WI007 and are clear of peaks, turn north and show the Zugspitze to passengers! ... is a special performance departure (RNAV and steep climb) towards MOGTI along waypoints. ... on the initial visual circle is to tune in the 66° bearing of OEJ into the VOR localizer or heading and engage the autopilot after takeoff. These folks do not turn left, but right directly into the Martinswand wall. Why? Because most autopilots turn the shorter side, and the shorter side is a right turn! Virtual rock climbers will complain about the noise and the debris. ... are available on pilots' request towards either side. You are cleared for a visual departure along the valley. Once clear of peaks, you get a direct to the next waypoint of your route. your flight path is free of clouds. For LOC DME East this means: At 1,6nm OEV DME you should see ground, slopes and the runway or go around. For LOC DME West this means: Overflying the airport, you should see the airport which is roughly 1,5km below you, and at RUM DNB you should see ground and the right mountain slope, which is a good 2km away (if you don't see the slope, you can't turn without hitting it). For LOC DME East this means: At about 3nm OEV DME you should see ground, slopes and the runway or go around. For LOC DME West this means: Overflying the airport, you should see the airport which is roughly 1,5km below you, and at RUM DNB you should see ground and the right mountain slope, which is a good 2km away. It is up to pilots to monitor conditions at landing! Exception 1: for Special Performance Departure: RVR 300m. It is up to pilots to monitor conditions, but Tower may deny takeoff clearance if visibility is below minima according to METAR (But VATSIM controllers are polite - they don't like to deny anyone taking off - so it's most likely up to pilots again). This page was last edited on 4 May 2017, at 15:59.